I have always held an aversion for High Dynamic Range (HDR) photography. Much of this probably stems from the awful, technicolor, hyper-tonemapped and unrealistic images I have seen using the technique. It was not until I recently viewed a video by Gavin Hoey titled “Shooting and Creating Photo Real HDR” that I thought there might be a place for HDR in my photography. I have always been an advocate of getting it right in camera. Therefore, I try to compose my images so minimal cropping is required, wait for the light to be right and in regards to overcoming the limited dynamic range of digital sensors, I use neutral density filters. However, there are instances where even grad ND filters are no match for a given scene. One such instance was in the photo above. 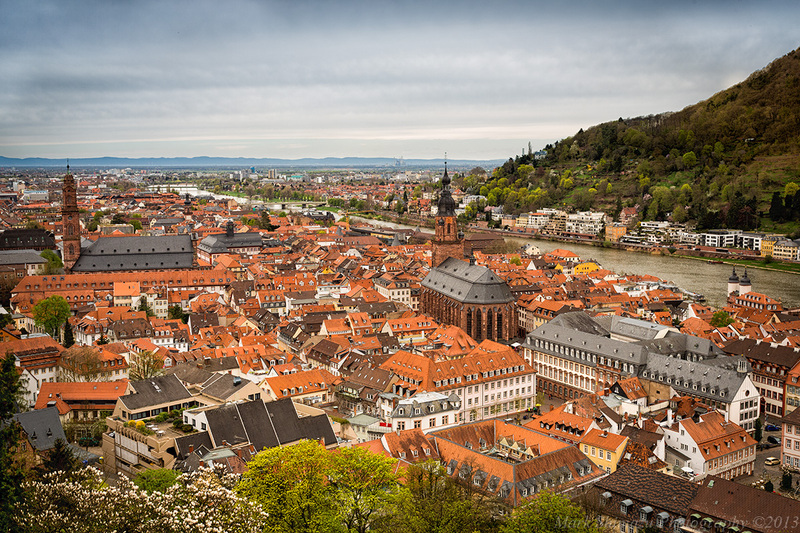 Most of the day was very overcast in Heidelberg, Germany and I was hoping the conditions would improve as I made my way up to the Castle. I arrived around 1.5hr prior to sunset and could see to the west that the cloud cover was breaking on the horizon, but low overlying clouds still obscured the sun. I waited until the sun was low enough to break the clouds and was rewarded by a brilliant sunset. The sun bathed the entire scene a beautiful orange glow about 10 minutes prior to sunset and enhanced the already vibrant clay tiles on the roofs of the city below. I manually made a 6-shot bracketed exposure starting with 1/15s all the way up to 2s in 1-stop increments (I probably could have done 2-stop increments but chose 1-stop for reasons explained below). I still used a 2-stop graduated ND filter and was hoping for a single image that retained highlight and shadow detail so I would not have to apply HDR, thus the 1-stop instead of 2-stop brackets. However, the scene’s dynamic range was far too great so I was forced to use a 6-stop photomerge which I did in Photoshop (if you are interested in the technique, click the link to the YouTube video in this same post). Recently, I shot the San Diego skyline under different lighting conditions to show the viewer the different looks one can achieve at different parts of the day. 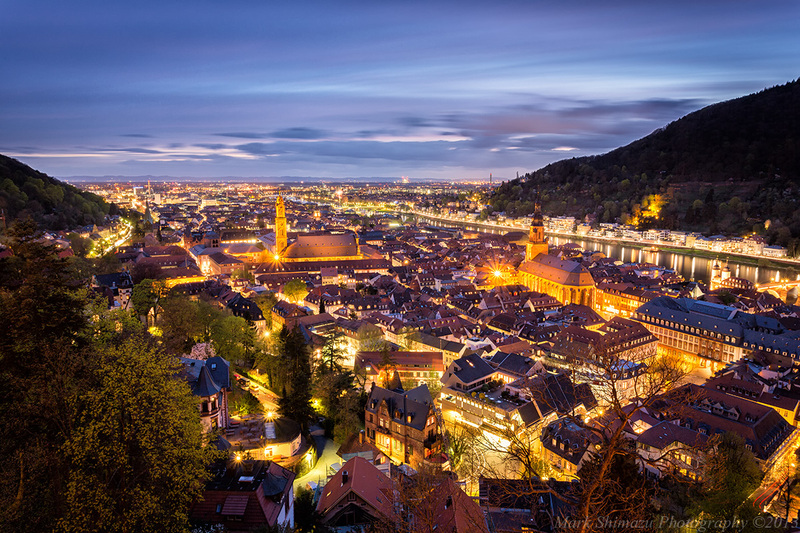 I chose to do something similar for the vista of Heidelberg. The image above was made around 2pm in the afternoon during an overcast day. The contrast of the scene was controllable due to the cloud cover. There is no dramatic lighting, but I think it still makes for a pleasant image. The image above was made with a slightly different composition as I wanted to include more of the sky in the image. About 10 minutes after sunset the glow reflecting off of the city was mostly gone, but the clouds lit the sky up a brilliant orange and purple color. As with the shot taken prior to sunset, I used a 5-shot exposure bracket ranging from 1/8s to 2s in 1-stop increments and merged it into a HDR image to capture the full dynamic range of the scene. I think you will agree that HDR photography definitely has its advantages in being able to, through multiple bracketed exposures, greatly increase the limited dynamic range of sensors without sacrificing ultimate image quality by stacking multiple filters. The final photo of the day was shot around 40 minutes after sunset. Some light remained in the sky which balanced the lights coming from the city lights. I always like to shoot “night” cityscapes during this period since I always feel that having a pitch black sky (as would be the case if the shot was made any later) does not add anything to the image. I would much rather have some light remaining in the sky with the detail it provides to the clouds rather than a black void without structure or detail. Since most of the light was gone, I had to use a 118s shutter speed to achieve the desired exposure. As with all of my shots that are made from a tripod, I applied Liveview for focus and exposure using the live histogram and tripped the shutter with a remote release with the camera in bulb mode to achieve the long exposure. I prefer the photo shot right after sunset!! What a stunning view! Thanks for your comment. I really like how the sky lit up for this shot. Thanks for stopping by Zach. The 17-40mm is really tack sharp in the center, but be aware that you have to stop down to f/8 – f/11 to get the corners sharp. The other Canon lens in that range and something I considered was the 16-35mm f/2.8 but could not justify double the price for f/2.8 versus f/4 when I knew this lens would be used for landscape photos at f/8 and beyond. It is really a bargain in Canon’s lineup of L lenses and would recommend it. Only when Canon can produce something to match Nikon’s 14-24mm f/2.8 and can take filters will I part with the 17-40mm. A lovely collection of shots. Your successful use of HDR techniques to produce the two interesting photos has convinced me that there is some merit to it, if created thoughtfully. By coincidence only yesterday I viewed a slightly humorous two part video rant about HDR photography by a professional photographer with a YouTube account. He did concede that there might be some limited use for the technique. He also mentioned that the principles of multiple exposures to compose a single photo dated back to the late 1800s, as well as being used in the 1940s and 50s to photograph nuclear bomb tests! Of your pictures I have to say that my preference is for the third one, as the brilliance of the sunlight in the first was a little too much, although it is possibly more appealing to others. The neutral daytime shot (2) is factual, but otherwise not outstanding – it was a good idea to include it for comparison. The 4th picture, the long exposure dusk shot is a very close second preference for me. I love the way the more prominent lights have formed little stars with multiple beams of light. Although pretty, some of the detail is lost in the glare of the lights, which again may appeal to others, but for me that meant it wasn’t the first choice. Thanks for your always thoughtful comments. I really appreciate your critique of my photos. It helps me learn and grow as a photographer and informs we what works and what doesn’t. 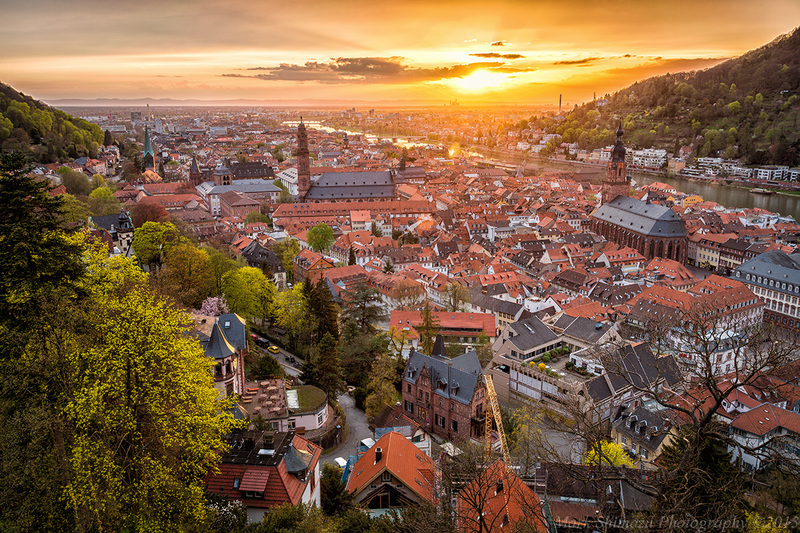 Heidelberg looks lovely. Your 3rd photo is my favourite. Interestingly, the river stands out best in your 2nd shot. Thanks for the video HDR link.. Thanks for your comments. AdoramaTV (as well as BHphoto) have great instructional videos on their respective YouTube channels. I have learned so much by watching them. Beautiful! If I ever get a camera that does HDR this is how I’d like to use it. Thanks for visiting. This was not automated HDR in camera (although the 5D Mark III can do automated HDR), but manual bracketing and merging of RAW files in Photoshop. You will be able to achieve similar effects with the gear you have already. If you have not already, take a look at the video link in the post, it provides a nice step-by-step tutorial on what was done. Mark – this is a great set. I think you’ve done a great job showing how HDR can help when you need it. I have a love / hate relationship with HDR. I’m still trying to be good at it, and by “good” I mean using it so that viewers really can’t tell it is HDR. It definitely has its place, but it can be way overdone. Yeah, I think the best HDR photos leave the viewer wondering “Is this HDR?”. This is my first attempt at HDR and look forward to using it more in my work as I was pleased by the results. Great shots and I agree on the HDR needing to be realistic. As someone who does mostly HDR I learned early the difference between bad and good HDR. There is so much bad HDR on the web and people that just take it straight from Photomatix (if they aren’t manually blending) are really pushing some bad stuff out there and giving a bad name to what is a very useful technique for bringing out all the details/colors that the eye sees. Great set of shots – this is a very picturesque town. Thanks for sharing your thoughts on HDR. Sounds like we share similar opinions about it. Yeah no kidding about the Christmas Market. If you have any photos of your former hometown, please share them on your blog. I had a wonderful but short stay there and would like to have seen more of the city. It’s great to see these photos shot at different times of the day. The sunset and the 40-minutes after sunset photo are really lovely. Thanks for stopping by Cardinal and for your comments. I try my best to post things that might help other photographers. One way is to show how different a scene can look at different times of day. Fantastic photos of my home town!! Cornelia, thanks for stopping by. You really should explore the city. 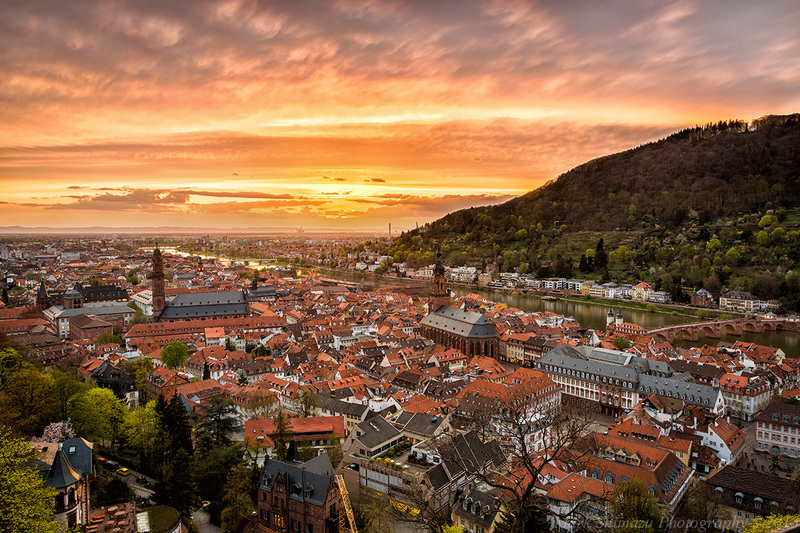 I have been to several cities in Germany, and I feel Heidelberg is the most beautiful of all that I have visited.